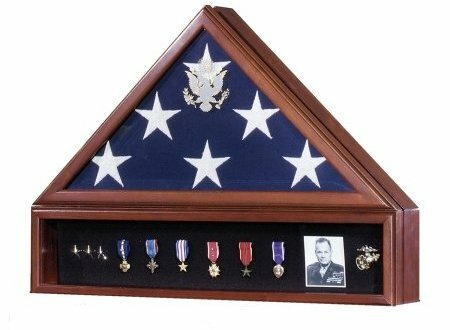 Our Admiral Flag Case with Shadowbox for medals and photos provides a beautiful and functional tribute to commemorate your veteran's service to our country. This set includes our highest quality embossed beveled glass flag display case along with our medal display case shadowbox. Free optional Great Seal of the United States. 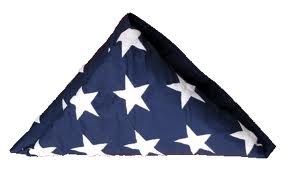 For display of 5' x 9 1/2' American or Burial Flag. Made of Solid American Hardwood with our exclusive Cherry Finish. Solid wood finished back. The Medal Display Case Shadowbox has Glass front and black Velcro friendly insert including Velcro tape & instructions for easy mounting and display of pictures, military medals and other memorabilia. The Admiral Flag Case with Shadowbox includes a FREE Black on Brass Engravable Nameplate (5" X 1.5") and Up to 3 lines of FREE personalized engraving (maximum 38 characters per line including spaces). Your Admiral Flag Case with Shadowbox will be built in the mountains of North Carolina by skilled wood craftsmen who take deep pride in their work for our veterans and heroes. We select beautiful hardwoods, cut and sand each piece to exact dimensions then we carefully join each piece with the best furniture making techniques. A multi-step finishing process ensures that your Admiral Flag Case with Shadowbox will be an heirloom for generations.